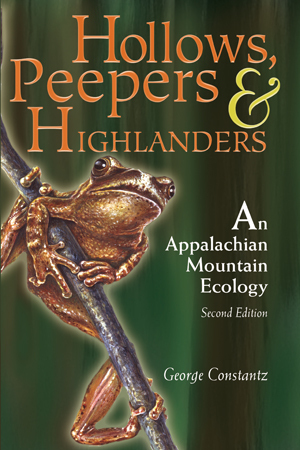 In this revised and expanded edition of Hollows, Peepers, and Highlanders, author George Constantz, a biologist and naturalist, writes about the beauty and nature of the Appalachian landscape. While the information is scientific in nature, Constantz’s accessible descriptions of the adaptation of various organisms to their environment enable the reader to enjoy learning about the Appalachian ecosystem. The book is divided into three sections: “Stage and Theater,” “The Players,” and “Seasonal Act.” Each section sets the scene and describes the events occurring in nature. “Stage and Theatre” is comprised of chapters that describe the origins of the Appalachia region. “The Players” is an interesting and in-depth look into the ecology of animals, such as the mating rituals of different species, and the evolutionary explanation for the adaptation of Appalachian wildlife. The last section, “Seasonal Act,” makes note of the changes in Appalachian weather each season and its effect on the inhabitants. Born in Washington, DC, in 1947, George Constantz spent six years of his childhood in Barranquilla, Colombia, among the iguanas of the Magdalena River’s floodplain, and in Chihuahua, Mexico, where he chased roadrunners through the desert. Since receiving a BA in biology from the University of Missouri-St. Louis and a PhD in zoology from Arizona State University, Constantz has worked as a park naturalist, a teacher of biology and environmental science, a fish ecologist, researcher, and writer. He founded Cacapon Institute, a nonprofit organization dedicated to conserving Appalachian rivers. Currently, he manages the Education Program at the Canaan Valley Institute. He lives with his wife, Nancy Ailes, in the Cacapon River watershed of West Virginia.